Cobblers succumbed to their first home league defeat since early September in disastrous circumstances when they were trounced 4-0 by play-off chasing Colchester United at the PTS Academy Stadium on Saturday. Town had held their own in the first-half, despite trailing to Frank Nouble's poorly-defended opener, but they fell apart in the second period, regularly cut to ribbons on the counter-attacking by the clinical visitors. A three-goal blitz either side of the hour-mark did the damage and ensured Northampton matched their worst defeat of the season, leaving people in no doubt as to the fact they now face a battle to retain their Football League status over the remaining 16 games of the season. The only good news to come out of a miserable afternoon were defeats for relegation rivals Macclesfield and Yeovil, but Town will have to improve to avoid an ugly, potentially disastrous end to the campaign. 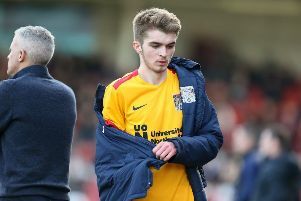 Deadline day signings Charlie Goode and Marvin Sordell were thrown straight in for their Cobblers debuts by Keith Curle, who also brought back John-Joe O'Toole for his first appearance since November. O'Toole was partnered by fit-again Shaun McWilliams and Timi Elsnik in midfield as Town again went with three at the back, and they should have taken an 11th-minute lead against Colchester when an early chance fell at the feet of Sordell. He could only poke wide with the goal gaping though, wasting terrific approach play by the marauding Aaron Pierre, while for United, Sammie Szmodics curled a yard or two over from the edge of the box. Colchester had otherwise been kept on a tight leash by the Cobblers with most of the play coming at the other end, but it was the visitors who struck against the run of play 25 minutes in. Town paid the price for slack marking from a corner, allowing Harry Pell to win the first header and nod down to Nouble, who was able to turn close to goal and scramble a shot through several bodies and into the net. Colchester were buoyed by the goal and Goode made a couple of excellent and important blocks as Pell and Szmodics let fly with long-range efforts. The Cobblers had retreated into their shells since falling behind but they almost levelled before half-time when Ash Taylor's fierce volley stung the palms of visiting stopper Rene Gilmartin. In the opening seconds of the second-half, Sordell again couldn't make the most of a clear opportunity when a long ball over the top found him through on goal, with Gilmartin out quickly to pull off a fine stop. And that came back to haunt the Cobblers when Colchester scored twice in three decisive minutes to put the game to bed and have home supporters venting their frustrations. Town were cut to shreds on both occasions, Sczmodics slicing through the middle to create the first as Eisa, only just on, was left in acres of space on the left edge of the penalty area to power a shot through David Cornell. Eisa, making his debut for the club, was also involved in United's third just moments later, combining well with Kane Vincent-Young who, again given the freedom of the penalty box, smashed into the corner. There was no respite for the Cobblers and 13 minutes later Colchester added another, this time former Town loan man Brennan Dickenson racing down the left and squaring for the excellent Szmodics to slot past Cornell. Gilmartin denied Junior Morias but United pressed for more goals with Taylor producing a brilliant block and then Cornell keeping out Pell's spot-kick after Jack Bridge's foul on Callum Roberts five minutes from time. A late miss from substitute Daniel Powell rather summed up a miserable afternoon for the Cobblers, the midfielder woefully side-footing wide with the goal at his mercy.